We purchased a house last year and a previous owner obviously enjoyed gardening. There are some beautiful plants that have popped up, but I was hoping to please have some help in identifying what I believe are weeds (although I’m not entirely certain). 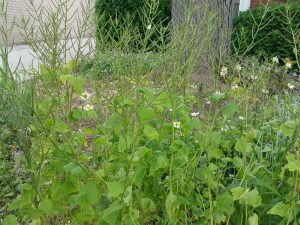 This plant is hesperis matronalis (know as Sweet Rocket, and Dames Rocket and other common names). It is a native of Eurasia and is often intentionally grown in gardens. It is prized for its sweet scent and can has culinary uses (typically as a garnish) as it is edible. However in North American this plant has escaped gardens and is considered to be a weed by some. You could try removing all of it from your garden; however as it is short lived and non invasive perenniel you might simply allow it to flower each year and then either remove or cut back the plants before the seeds can spread.